Guillermo Calderon’s “Kiss” speaks powerfully on our western ignorance about the Middle Eastern wars. Although ‘Kiss” begins with comic, melodramatic acting and a messy love triangle, Calderón is tackling our willful blindness about the lives of other people. 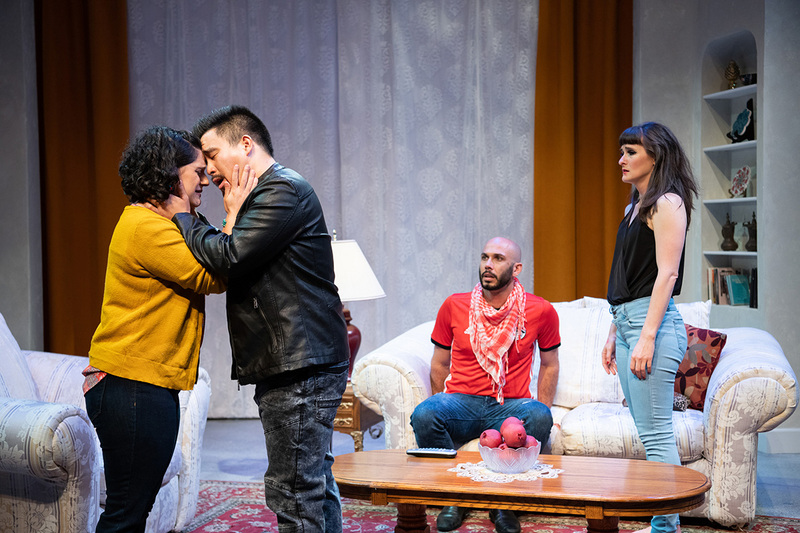 “Kiss” breaks down barriers between the stage and daily life. We laugh out loud, sitting on the edge of our seats. The over-the-top emotions of purposely self-conscious actors push us to reevaluate our lack of global awareness. Calderon encourages us to walk in a Syrian’s shoes, a profoundly moving experiment. Director Evren Odcikin does an outstanding job, making a strong and meaningful statement. He takes us on a turbulent ride, facing the obstacles of western isolation. “Kiss” centers around two young couples: First, Ahmed and Hadeel (animated Wiley Naman Strasser and vibrant Roneet Aliza Rahamim) are moving toward marriage. The second couple, Youssif and Bana (passionate Phil Wong and fiery Elissa Beth Stebbins), have just broken up. These four actors gather to play soap opera characters in a “found” script. We are delightfully puzzled about what is real or what is artificial. These multi-talented actors have us laughing with exaggerated acting as they navigate love troubles. When Bana struts onto the stage, her personality fills the room. Her elegant jet-black hair, flashy shawl, sky-high heels, and bold red lips embody her soap opera star diva attitude. After a while, the foursome’s ridiculous antics become drawn out; the humor gets cheesy, but later it turns out to be intentional. 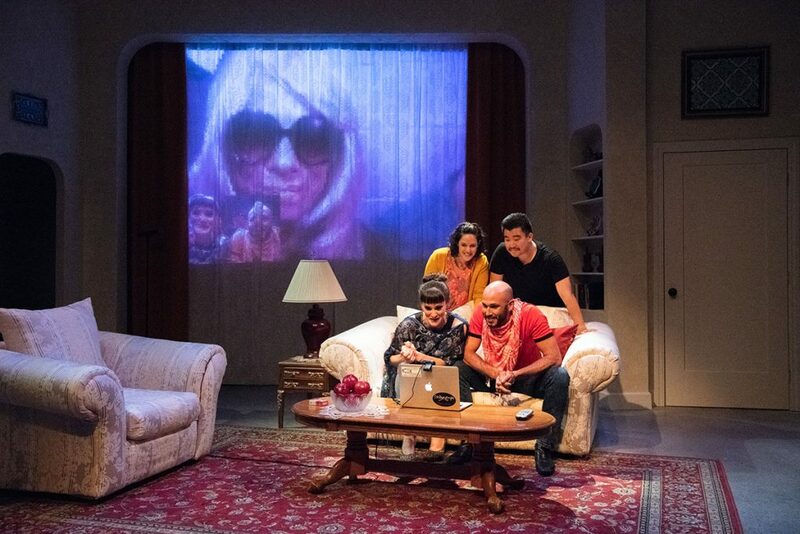 After their rehearsal, the actors sit down for a video chat with the script’s mysterious playwright, called “Woman” (convincing Rasha Mohamed). Speaking from a moving taxi in Lebanon with a translator at her side, “Woman” reveals that she is a refugee from the wars in Syria. 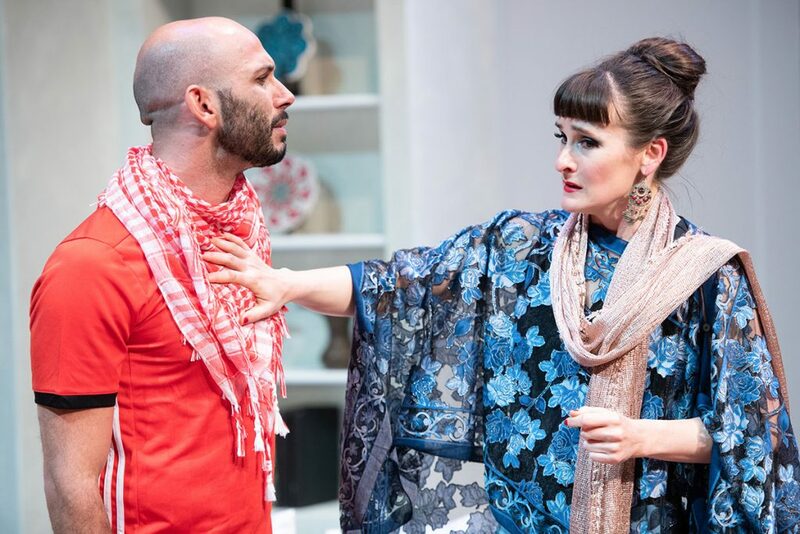 She claims that the Syrian disaster gives meaning to her play. Troubled by their mistakes, they try again, with new humanity. 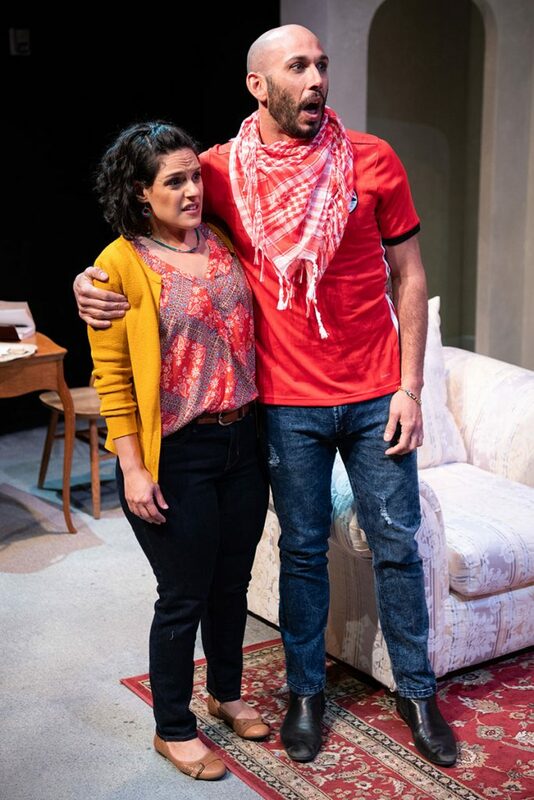 The actors are determined to faithfully portray Syria immersed in war. In their second rehearsal, they enact horrendous realities, not mere TV clichés. “Kiss” is transformed from soap opera into a profound plea for international justice. The war comes home: Gunshots go off, furniture goes flying. The toxic residue of war smothers Hadeel’s romantic spark. Calderón’s “Kiss” asks: How can we understand remote cultures, when we are constantly translating them in to our own cliches? Social media and television offer the gift of avoiding reality. We are distracted by addictive “entertainment” echoed in the soap opera called “Kiss.” Praise to Calderón for providing a multi-layered drama that awakes us to the rest of the world. 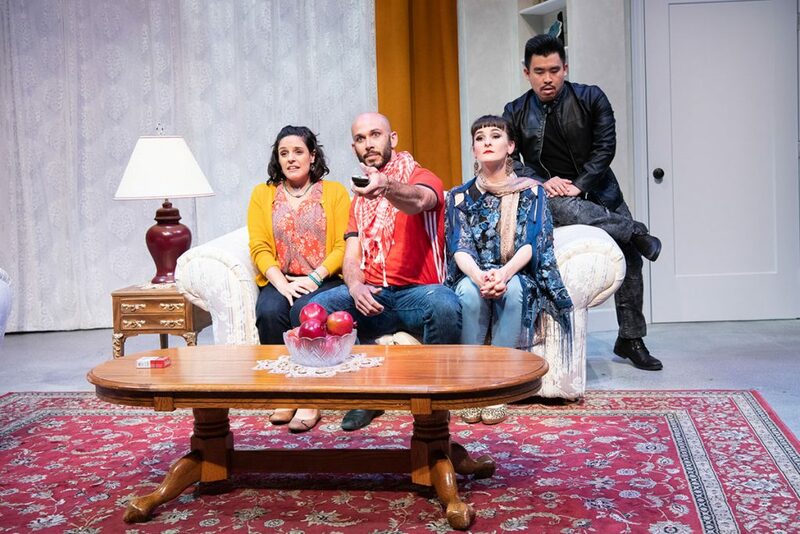 Cast: Rasha Mohamed, Roneet Aliza Rahamim, Jessica Lea Risco, Elissa Beth Stebbins, Wiley Naman Strasser, and Phil Wong. Colonialism, hypocrisy, Imperialism, melodrama, Middle East, refugees, soap opera, Syria, U.S.